Priced at Rs 15,995, the Ultimate Ears BOOM 3 is available in three dual-tone colours on Amazon India. Ultimate Ears has launched the BOOM 3 bluetooth speaker with ‘magic button’ at a price of Rs 15,995 in India. The waterproof bluetooth speaker is available in three dual-tone colours on Amazon India. The Magic Button allows users to play, pause and skip tracks directly on the speakers. When paired with the redesigned BOOM by Ultimate Ears iOS mobile app, users will also have one-touch access to all of your favorite playlists on Apple Music. Ultimate Ears, a brand of Logitech International, has launched the next generation of bluetooth speaker, the Ultimate Ears BOOM 3. 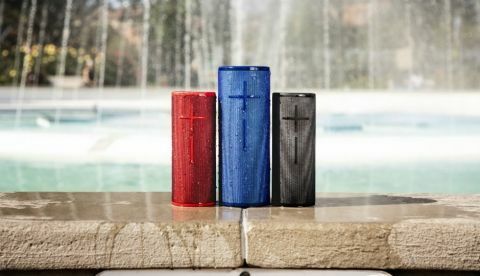 This portable, waterproof Bluetooth speaker has been redesigned with stunning two-toned, high performance fabric, engineered for applications like motorcycle jackets and fire equipment. Also new to BOOM 3 is a Magic Button on top of the speaker for convenient music control. Each speaker has carefully balanced audio and 360-degree sound that lets you hear every note just as the artist intended. The all-new Magic Button allows you to play, pause and skip tracks directly on the speakers. When paired with the redesigned BOOM by Ultimate Ears iOS mobile app, you will also have one-touch access to all of your favorite playlists on Apple Music, which offers an entire catalog of more than 45 million songs. Music fans can also use the Magic Button to access their playlists on Deezer Premium—which offers 53 million tracks—on Android and soon on iOS. Additional music services will be added. Other upgrades to BOOM 3 include a new IP67 rating so the speakers are not only waterproof and drop proof, but also dustproof, making them ready for any adventure. Improved Bluetooth range up to 150 feet enhances portability and the speakers float, so you don’t have to worry about losing them at the bottom of a lake or river. For added convenience, BOOM 3 speakers are compatible with the Ultimate Ears POWER UP charging dock (sold separately) for a simple, wireless charge, plus you can charge the speakers upright thanks to the repositioned USB port. The BOOM app also offers all of the features you love from previous speakers like PartyUp—which works with all generations of BOOM and allows you to connect up to 150 speakers—as well as a custom equalizer (EQ), and remote on/off controls, all in a newly designed interface. Ultimate Ears BOOM 3 will be available on amazon.in from January 17, 2019 for INR 15,995/-. BOOM 3 will be available in three dual-toned colors: Night (Black), Sunset (Red) and Lagoon (Blue). Lumia 540+91-9478661379 best astrologer for black magic specialist in india ? when i purchse xiomi redmi note 3 in india? When Redmi 3 Or Redmi 3Pro Launch in india?